Optech Incorporated develops, manufactures and supports advanced, Lidar-based survey solutions. Established in 1974 as a privately held, Canadian-owned research and development firm, Optech was originally an offshoot of research conducted by its founder, Dr Allan Carswell at York University in Toronto. This research into light detection and ranging or Lidar, also known as ‘laser radar’, was the basis for the company that is Optech today. Even before its inception Optech was involved in developing a Lidar system for underwater probing. Dr Carswell initiated the first Optech marine Lidar project in 1971. By March 1973 he had a working system and, although the peak power was only about 100 watts, the system had excellent range resolution. The results of this first project formed the basis for the airborne Lidar bathymetry work that remains one of Optech’s main focuses today. Airborne Lidar Bathymetry (ALB) relies on the differential timing of laser pulses reflected from water surface and underwater bottom to determine water depth at the point where the laser pulses strike the water bottom. The timing of the pulses is measured, processed and interpreted to yield accurate estimates of water depth. In the late 1970s and early 1980s Optech worked with the Defense Research Institute (FOA) in Sweden and the Canada Centre for Remote Sensing (CCRS) in Canada on continuing trials of ALB systems. This led to the development of the FLASH-1 prototype ALB system for FOA, and the LARSEN-500 operational prototype ALB system for CCRS. In fact, the LARSEN-500, though delivered in 1985, remained in operation until 2004. 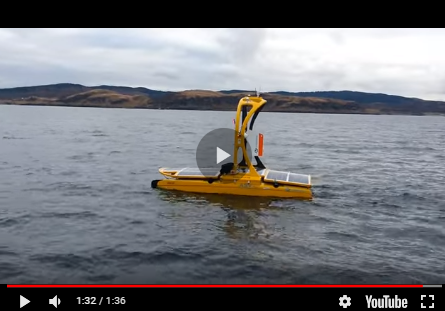 Before the decade was out Optech had built ALARMS, a scanning system for the detection of underwater mines for the US Defense Advanced Research Projects Agency (DARPA). Then in 1991 the Swedish Hydrographic Department and the Swedish Navy ordered two systems with Saab Instruments as prime contractor and Optech as major subcontractor. These two systems, known as HAWKEYE, were delivered to Sweden in 1994 and 1995. Meanwhile, the US Army Corps of Engineers contracted Optech to develop an operational ALB system, the SHOALS-200, delivered in 1994. Originally installed in a Bell 212 helicopter, this system was upgraded in 1998 to a SHOALS-400 and was outfitted for operation in a Twin Otter fixed-wing aircraft. Meanwhile, in January 2001Optech had started building its latest generation ALB system, the SHOALS-1000 and delivered it to Japan Coast Guard in early 2003. SHOALS-1000 collects one thousand water-depth soundings per second with IHO ‘order 1’ accuracy. In the summer of 2003 the first SHOALS-1000T, featuring integrated topographic mapping capability at 10kHz (10,000 elevation measurements per second), was tested in Florida and delivered to the US Navy. Optech is currently developing its next-generation airborne Lidar bathymeter for 2005. In addition to the success it found with its ALB projects in the 1980s, Optech also developed a number of different Lidar systems for various applications including atmospheric monitoring, range-finding, and terrestrial mapping. In the early 1990s, ground-based Differential Absorption Lidar (DIAL) systems were installed at several Arctic sites to monitor stratospheric ozone. Around the same time, Optech developed the compact, versatile laser range-finder at the heart of its current process control and airborne terrestrial mapping instruments, and delivered its first Airborne Laser Terrain Mapper (ALTM). Rapid growth in the mid-1990s spurred a company move to a larger facility and in 2001, expansion into adjacent buildings as well. Also in 2001, Optech created its first US-based subsidiary, Optech International, Inc., located in Kiln, Mississippi, at the Stennis Space Center; company facilities here include offices, laboratories, test ranges and other special integration and test areas, as well as an aircraft for flight-testing airborne systems. In addition to SHOALS and ALTM, Optech manufactures a ground-based, tripod-mounted laser imaging system, ILRIS-3D (Intelligent Laser Ranging and Imaging System). While the data from all three systems stands on its own, Lidar data from SHOALS and ALTM can be combined with ILRIS-3D data to create even denser 3D datasets and elevation models. Optech also designs and manufactures industrial and mining equipment, such as level monitors and the CMS (Cavity Monitoring System) used in mines around the world. Current development efforts include work with the Canadian Space Agency, the European Space Agency and NASA in two key areas: 3D range-imaging for autonomous space docking and landing, and space-based Lidar for the measurement of atmospheric constituent species such as ozone and water vapour. Optech employs more than 225 people across its offices in Canada and the United States. The Optech family is a mix of scientists, engineers and technical and marketing specialists, as well as management and administrative staff, all working in concert to provide the best products and service to its customers. Because of the company’s broad product range it has a diverse client base, ranging from government organisations to universities, from small mining companies to large multinational corporations. These clients are located around the globe, with Optech systems operating on six continents. Optech systems range in value from US$ 5,000 for a basic laser range-finder to US$ 5,000,000+ for a state-of-the-art combination hydrographic/topographic airborne Lidar mapper with digital camera and multi-spectral imaging capabilities. More than 95% of Optech sales are international and the company continues to focus on introducing Lidar to new markets and areas. The company’s revenue surpassed US$ 40 million in 2004. Optech consists of five major divisions: Terrestrial Survey, Marine Survey, Laser Imaging, Industrial Products and Space and Atmospheric. Each division represents a speciality but all five share a common mission: to design and manufacture precision measurement instruments utilising pulsed Lidar. In addition, the Technology Division continues to research and develop core Optech expertise in lasers, engineering, physics and software. Each of Optech’s five divisions responds to sales challenges in different ways but the company’s focus on a single technology stream, time-of-flight Lidar solutions, is what drives all of its development. Optech actively looks for new challenges that will lead to new products, and new markets that will lead to new opportunities Regionally, there are enormous differences in the ways that Optech divisions market its products. The ALTM has already seen significant sales in both the United States and Japan but there is a disparity between sales in these markets and the rest of the world. Optech has recently sold China its first airborne Lidar system and continues to focus on system sales in the region as many areas of China remain poorly mapped. Optech also expects strong interest in SHOALS in China and Southeast Asia, where the many island archipelagos face a significant coastal mapping need. Optech partners with leading technology companies such as Z/I Imaging and MDA (designers and builders of the Canadarm) to bring complementary technologies and solutions to market with its own. In addition to Optech’s internal dedicated sales force the company partners with distributors around the world who use their local expertise in their marketplaces. Finally, in order to foster new opportunities Optech actively embraces delivering custom-designed systems to meet the demands of emerging markets. Over the past decade, the company has averaged approximately 15% annual growth and has doubled its staff over the past three years. From its very inception Optech has always kept a clear focus on the future not only of the company but that of Lidar technology itself. There is a strong emphasis on R & D and the company continually leverages its years of experience and expertise to bring new and better Lidar solutions to market. It is this focus on R & D that keeps Optech ahead of the competition, both in terms of technology leadership and sales figures.